Timothée Hal Chalamet[a] (born December 27, 1995) is a French and American actor. He began his acting career in short films, before appearing in the television drama series Homeland in 2012. Two years later, he made his feature film debut in the drama Men, Women & Children and subsequently appeared in Christopher Nolan's science-fiction film Interstellar. 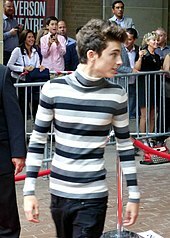 Chalamet was born on December 27, 1995 in New York City's Manhattan borough and grew up in the Hell's Kitchen neighborhood. His parents are Nicole Flender, a real estate broker and former Broadway dancer, and Marc Chalamet, an editor for UNICEF. His American mother, a third-generation New Yorker, is Jewish (of Russian Jewish and Austrian Jewish descent), and his French father, who lived in Nîmes, is from a Protestant background. Growing up, Chalamet spent summers in Le Chambon-sur-Lignon, a small French village two hours away from Lyon, at the home of his paternal grandparents. His paternal grandmother, who had moved to France, was originally Canadian. 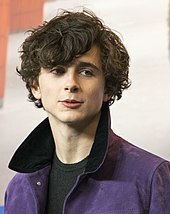 Chalamet stated that his time in France led to cross-cultural identity issues. "Once I was there, I became the French version of myself," he told La Presse. "I was completely imbued with the culture, and I even dreamed in French." His childhood dream was to become a professional soccer player, "I was a coach at a soccer camp in France. I coached six to ten-year-olds when I was around thirteen." 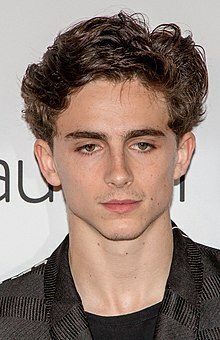 Chalamet attended PS 87 William T. Sherman School for elementary school, and later the selective Delta program at MS 54 Booker T. Washington Middle School, which he described as a "miserable three years" due to the lack of a creative outlet within the school's academically rigorous environment. His acceptance into Fiorello H. LaGuardia High School of Music & Art and Performing Arts was a turning point in his appreciation for acting. He stated, "I had some excellent teachers and really fell in love with it. I saw that it could be and should be treated as a craft". Harry Shifman, his sophomore year drama teacher at LaGuardia, was so impressed by his audition that he insisted on Chalamet's acceptance into the school even though he had been rejected in the interview, saying "I gave him the highest score I've ever given a kid auditioning." He graduated in 2013 and starred in school musicals as Emcee in Cabaret and Oscar Lindquist in Sweet Charity. He is also a YoungArts alumnus. After high school, Chalamet attended Columbia University for one year, majoring in cultural anthropology. He later transferred to New York University's Gallatin School of Individualized Study to pursue his acting career more freely. As of December 2018[update], Chalamet has five upcoming projects. He will portray Henry V of England in David Michôd's historical drama The King, which will be distributed by Netflix. He will then play Theodore "Laurie" Laurence in Greta Gerwig's Little Women, an adaptation of Louisa May Alcott's novel of the same name, featuring an ensemble cast that also includes Saoirse Ronan and Emma Watson. He also will star as the main character Paul Atreides in Denis Villeneuve's adaptation of Dune, and in Wes Anderson's ensemble drama The French Dispatch. He has also completed work on Woody Allen's A Rainy Day in New York. Due to an accusation of sexual assault against Allen, Chalamet donated his salary to the charities Time's Up, LGBT Center of New York, and RAINN. Chalamet resides in New York City. He is fluent in English and French. He holds dual citizenship in the United States and France. ^ Chalamet's own pronunciation of his name in English is /ˈtɪməθi ˈʃæləmeɪ/ TIM-ə-thee SHAL-ə-may. In French, it is pronounced [timɔte ʃalamɛ], which he has described as the "real pronunciation", but he uses the anglicized form /ˈtɪməθi/, the usual pronunciation of the English Timothy, when speaking English, as he finds requiring others to pronounce it the French way "really pretentious" and "too much of an obligation". ^ Amazon Studios halted the release of the film indefinitely in the wake of the Me Too movement and long-standing allegations against Woody Allen, the director and screenwriter of the film. ^ "Don't Talk | Armie Hammer and Timothée Chalamet from CALL ME BY YOUR NAME". YouTube. Alamo Drafthouse. November 27, 2017. Retrieved January 13, 2018. ^ "Timothée Chalamet on His Dream Roles and 'Homeland'". Teen Vogue. October 1, 2014. Retrieved February 17, 2019. ^ Barrett, Devin (February 6, 2018). "Timothée Chalamet by Frank Ocean". V Man. Retrieved February 17, 2019. "Oscars: Hollywood s'arrache Timothée Chalamet, un Franco-Américain de 22 ans". LExpress.fr (in French). March 4, 2018. Retrieved March 23, 2019. "Rencontre avec Timothée Chalamet, "the next big thing" du cinéma hollywoodien". Les Inrocks (in French). Retrieved March 23, 2019. "Dans quels cas un enfant est-il Français ?". www.service-public.fr (in French). Retrieved March 23, 2019. ^ "Timothée Chalamet". Golden Globes. Archived from the original on September 19, 2018. Retrieved December 13, 2017. ^ a b c d Riley, Daniel (February 14, 2018). "The Arrival of Timothée Chalamet". GQ. Archived from the original on September 19, 2018. Retrieved April 25, 2018. ^ a b Piette, Jérémy (February 26, 2018). "Timothée Chalamet, appelez-le par son nom" [Timothée Chalamet, call him by his name]. Libération (in French). Archived from the original on September 19, 2018. Retrieved March 2, 2018. ^ a b Josh Horowitz (December 8, 2017). "Happy Sad Confused". Stitcher (Podcast). MTV. Retrieved April 25, 2018. ^ Kellaway, Kate (October 15, 2017). "Call Me By Your Name's Oscar-tipped double act on their summer of love". The Guardian. London. Archived from the original on September 19, 2018. Retrieved April 13, 2018. ^ Bloom, Nate (March 29, 2018). "Celebrity Jews: Timothée Chalamet & TV Catch-Up". The Jewish News. Archived from the original on September 19, 2018. Retrieved April 25, 2018. son of an American Jewish mother and a French Protestant father. ^ "Oscars: Hollywood s'arrache Timothée Chalamet, un Franco-Américain de 22 ans". LExpress.fr (in French). March 4, 2018. Retrieved February 10, 2019. ^ Nepales, Ruben V. (February 9, 2018). "Will Timothée Chalamet be the youngest Oscar best actor winner at 22?". Philippine Daily Inquirer. Archived from the original on September 19, 2018. Retrieved April 27, 2018. ^ a b c d Herman, James Patrick (February 6, 2015). "Timothée Chalamet – Takes off in Interstellar". Verge Magazine. Archived from the original on February 6, 2015. ^ Demars, Céline (March 3, 2018). "Les racines auvergnates de Timothée Chalamet, nouveau chouchou d'Hollywood à 22 ans". La Montagne (in French). Archived from the original on September 19, 2018. Retrieved June 15, 2018. ^ a b Marotta, Jenna (November 17, 2017). "'Call Me by Your Name': Timothée Chalamet is Learning How to Be a Man, Onscreen and Off". IndieWire. Archived from the original on September 19, 2018. Retrieved January 23, 2018. ^ Lussier, Marc-André (December 15, 2017). "Timothée Chalamet, nouvelle étoile du cinéma mondial". La Presse (in French). Archived from the original on September 19, 2018. Retrieved January 23, 2018. ^ "PeopleHop: Timothée Chalamet". Bwog. September 19, 2013. Archived from the original on September 19, 2018. Retrieved August 27, 2017. ^ Scott Feinberg (February 19, 2018). "'Awards Chatter' Podcast — Timothee Chalamet ('Call Me by Your Name')". The Hollywood Reporter (Podcast). Event occurs at 34:04-34:17. Archived from the original on September 19, 2018. Retrieved June 17, 2018. ^ Duboff, Josh (January 19, 2018). "Meet Timothée Chalamet and Ansel Elgort's High-School Drama Teacher, Mr. Shifman". Vanity Fair. Archived from the original on September 19, 2018. Retrieved June 16, 2018. ^ Freedman, Adrianna Chaviva (February 5, 2018). "Timothee Chalamet Is The Youngest In 80 Years To Be Nominated For Best Actor". The Forward. Archived from the original on September 19, 2018. Retrieved April 27, 2018. ^ "2013 YoungArts Winners" (PDF). YoungArts. Archived (PDF) from the original on September 19, 2018. Retrieved December 9, 2017. ^ West, James (March 31, 2018). "Back in the day with Timothée Chalamet". HERO Magazine (published April 30, 2015). Archived from the original on September 19, 2018. Retrieved March 31, 2018. I'm at Columbia University in New York, majoring in cultural anthropology. ^ Kaufman, Amy (November 17, 2017). "Timothée Chalamet is Hollywood's next big thing with 'Call Me by Your Name' and 'Lady Bird'". Los Angeles Times. Archived from the original on September 19, 2018. Retrieved April 28, 2018. ^ Isherwood, Charles (August 16, 2011). "A 17-Year-Old Beanstalk From a Wholesome '70s Family Is Eager to Go Far Out". The New York Times. Archived from the original on September 19, 2018. Retrieved August 9, 2017. ^ Dziemianowicz, Joe (August 16, 2011). "'The Talls' review: Family drama is familiar story, but excellent acting gives play extra boost". New York Daily News. Archived from the original on September 19, 2018. Retrieved August 9, 2017. ^ Blake, Meredith (December 12, 2012). "SAG award nominations: Cable dramas and network sitcoms dominate". Los Angeles Times. Archived from the original on September 19, 2018. Retrieved August 9, 2017. ^ "Men, Women & Children Reviews". Metacritic. Archived from the original on September 19, 2018. Retrieved September 19, 2018. ^ Sneider, Jeff (July 15, 2013). "Christopher Nolan Casting Young 'Homeland' Actor in 'Interstellar' (Exclusive)". TheWrap. Archived from the original on September 19, 2018. Retrieved August 9, 2017. ^ Greene, Andy (April 8, 2015). "Readers' Poll: The 20 Best Movies of the 2010s So Far". Rolling Stone. Archived from the original on September 19, 2018. Retrieved July 21, 2017. ^ Anand, Gautam (November 6, 2014). "Review: 'Interstellar' is Awe-Inspiring". The Cinemaholic. Archived from the original on February 22, 2017. Retrieved July 21, 2017. ^ Travers, Peter (December 4, 2014). "10 Best Movies of 2014". Rolling Stone. Archived from the original on September 19, 2018. Retrieved July 21, 2017. ^ "Worst Friends (2014)". Rotten Tomatoes. Archived from the original on September 19, 2018. Retrieved August 12, 2017. ^ Debruge, Peter (February 12, 2015). "Berlin Film Review: 'One & Two'". Variety. Archived from the original on September 19, 2018. Retrieved September 19, 2018. ^ Gold, Daniel M. (August 13, 2015). "Review: 'One & Two' Exposes Dangers of Trying to Control Teenagers". The New York Times. Archived from the original on September 19, 2018. Retrieved September 19, 2018. ^ "One & Two (2015)". Rotten Tomatoes. Archived from the original on September 19, 2018. Retrieved December 24, 2015. ^ "The Adderall Diaries (2016)". Rotten Tomatoes. Archived from the original on September 19, 2018. Retrieved April 19, 2016. ^ "Love the Coopers (2015)". Rotten Tomatoes. Archived from the original on September 19, 2018. Retrieved April 24, 2016. ^ "Timothee Chalamet". Alumini and Friends of LaGuardia High School. Archived from the original on September 19, 2018. Retrieved September 2, 2017. ^ Rooney, David (May 1, 2016). "Lucille Lortel Awards: The Complete Winners List". The Hollywood Reporter. Archived from the original on September 19, 2018. Retrieved August 9, 2017. ^ Cox, Gordon (April 20, 2016). "Drama League Awards Nominations: Jessica Lange, Lupita Nyong'o, Jesse Tyler Ferguson and Lots More (FULL LIST)". Variety. Archived from the original on September 19, 2018. Retrieved August 23, 2017. ^ Brantley, Ben (February 9, 2016). "Review: 'Prodigal Son,' John Patrick Shanley's Exploration of the Student He Once Was". The New York Times. Archived from the original on September 19, 2018. Retrieved August 9, 2017. ^ Rooney, David (February 9, 2016). "'Prodigal Son': Theater Review". The Hollywood Reporter. Archived from the original on September 19, 2018. Retrieved August 9, 2017. ^ Farber, Stephen (March 14, 2016). "'Miss Stevens': SXSW Review". The Hollywood Reporter. Archived from the original on September 19, 2018. Retrieved August 16, 2017. ^ Holden, Stephen (September 15, 2016). "Review: In 'Miss Stevens,' a Chaperone Greets Temptation". The New York Times. Archived from the original on September 19, 2018. Retrieved August 16, 2017. ^ Raup, Jordan (May 23, 2016). "Michael Stuhlbarg, Armie Hammer & More Leading Luca Guadagnino's 'Call Me By Your Name'". The Film Stage. Archived from the original on September 19, 2018. Retrieved June 5, 2016. ^ Vivarelli, Nick (February 13, 2017). "Berlinale: Luca Guadagnino on Why 'Call Me by Your Name' Strikes Such Deep Chords". Variety. Archived from the original on September 19, 2018. Retrieved August 17, 2017. ^ McConaughey, Matthew (June 2, 2017). "Timothée Chalamet". Interview. Archived from the original on June 16, 2018. Retrieved August 9, 2017. ^ "Call Me By Your Name Reviews". Metacritic. Archived from the original on September 19, 2018. Retrieved January 29, 2017. ^ Greene, Steve (January 21, 2017). "Sundance 2017 IndieWire Critics Poll Results: Best Lead Performance". IndieWire. Archived from the original on September 19, 2018. Retrieved August 12, 2017. ^ Richards, Olly (October 23, 2017). "'Call Me By Your Name' Review". Empire. Archived from the original on September 19, 2018. Retrieved October 23, 2017. ^ "Hollywood Reporter Film Critics Pick the 13 Best Performances of the Year". The Hollywood Reporter. December 13, 2017. Archived from the original on September 19, 2018. Retrieved June 14, 2018. ^ Scott, A.O. ; Morris, Wesley (December 7, 2017). "The 10 Best Actors of the Year". The New York Times. Archived from the original on September 19, 2018. Retrieved December 8, 2017. ^ Gettell, Oliver (November 27, 2017). "Call Me By Your Name takes top prize at 2017 Gotham Awards". Entertainment Weekly. Archived from the original on February 20, 2018. Retrieved November 27, 2017. ^ a b "The 90th Academy Awards (2018) Nominees and Winners". Academy of Motion Picture Arts and Sciences (AMPAS). Archived from the original on March 10, 2018. Retrieved January 23, 2018. ^ Haylock, Zoe (February 23, 2018). "Timothee Chalamet - Oscars: 11 of 2018's Historic Nominees". The Hollywood Reporter. Archived from the original on September 19, 2018. Retrieved March 4, 2018. ^ a b Merry, Stephanie; Yahr, Emily (December 11, 2017). "Golden Globes nominations 2018: Complete list of nominations". The Washington Post. Archived from the original on February 20, 2018. Retrieved December 11, 2017. ^ a b c Nordyke, Kimberly (January 21, 2018). "SAG Awards: Complete List of Winners". The Hollywood Reporter. Archived from the original on February 21, 2018. Retrieved February 21, 2018. ^ a b "BAFTA Awards: 2018 Complete Winners List". Variety. February 18, 2018. Archived from the original on February 20, 2018. Retrieved February 20, 2018. ^ Evans, Greg (April 12, 2018). "'Hot Summer Nights' Trailer: Timothée Chalamet Gets Tangled Up In Weed". Deadline Hollywood. Archived from the original on September 19, 2018. Retrieved April 12, 2018. ^ "Hot Summer Nights Reviews". Metacritic. Archived from the original on September 19, 2018. Retrieved July 29, 2018. ^ Collins, K. Austin (July 26, 2018). "Timothée Chalamet Makes the Overwrought Hot Summer Nights Worthwhile". Vanity Fair. Archived from the original on September 19, 2018. Retrieved July 29, 2018. ^ Kohn, Eric (September 2, 2017). "Saoirse Ronan Scores Her Greatest Role In Greta Gerwig's Winning Directorial Debut 'Lady Bird' — Review". IndieWire. Archived from the original on September 19, 2018. Retrieved September 2, 2017. ^ Burr, Ty (November 8, 2017). "'Lady Bird' a wise, funny, empathetic tale from Greta Gerwig". The Boston Globe. Archived from the original on September 19, 2018. Retrieved November 8, 2017. ^ Pedersen, Erik (June 25, 2018). "Movie Academy Invites Record 928 For Membership". Deadline Hollywood. Archived from the original on September 19, 2018. Retrieved June 25, 2018. ^ Ford, Rebecca (February 6, 2017). "Sundance Breakout Timothee Chalamet Joining Steve Carell in 'Beautiful Boy' (Exclusive)". The Hollywood Reporter. Archived from the original on September 19, 2018. Retrieved March 27, 2017. ^ Glieberman, Owen (September 7, 2018). "Toronto Film Review: 'Beautiful Boy'". Variety. Archived from the original on September 19, 2018. Retrieved September 16, 2018. ^ Wiseman, Andreas (May 31, 2018). "Robert Pattinson, Lily-Rose Depp, Among Cast Joining Timothée Chalamet In Netflix Pic 'The King', Cameras Roll This Week". Deadline Hollywood. Archived from the original on September 19, 2018. Retrieved June 3, 2018. ^ Rich, Katey (September 8, 2018). "Timothée Chalamet Lost 20 Pounds for His Latest Role, but That Wasn't the Hard Part". Vanity Fair. Retrieved September 30, 2018. ^ Sharf, Zack (September 27, 2018). "Timothée Chalamet Raves About 'Dune' and Denis Villeneuve: 'If You Do a Big Movie, Make Sure It's With a Great Director'". IndieWire. Retrieved September 30, 2018. ^ Kroll, Justin (December 6, 2018). "Timothee Chalamet Joins Tilda Swinton, Bill Murray in Wes Anderson's "The French Dispatch"". Variety. Retrieved December 6, 2018. ^ Harmon, Steph (August 8, 2017). "Timothée Chalamet: 'I don't want to profit from my work on Woody Allen's film'". The Guardian. London. Archived from the original on September 19, 2018. Retrieved January 15, 2017. ^ Ng, David (September 16, 2018). "A year into #MeToo, some movies, including four Weinstein titles, are still stuck in distribution limbo". The Los Angeles Times. Los Angeles, California: Tronc. Retrieved September 20, 2018. ^ Pulver, Andrew (November 20, 2018). "'A terrible shame': Jude Law defends Woody Allen film after Amazon shelves it". The Guardian. London, England: Guardian Media Group. Retrieved December 4, 2018. ^ Boudsocq, Stéphane (February 28, 2018). ""La Ch'tite famille" et "Call Me By Your Name" dans les sorties de la semaine". RTL (in French). Archived from the original on September 19, 2018. Retrieved June 15, 2018. ^ Goldberg, Jacky (February 6, 2018). "Rencontre avec Timothée Chalamet, "the next big thing" du cinéma hollywoodien". Les Inrockuptibles (in French). Archived from the original on June 13, 2018. Retrieved June 13, 2018. ^ a b Kilday, Gregg (December 6, 2017). "Critics' Choice Awards: 'The Shape of Water' Leads With 14 Nominations". The Hollywood Reporter. Archived from the original on February 20, 2018. Retrieved January 19, 2018. ^ "Winners & Nominees 2019". www.goldenglobes.com. Retrieved January 9, 2019. ^ "EE British Academy Film Awards Nominees in 2019". www.bafta.org. January 9, 2019. Retrieved January 9, 2019. ^ "Announcing the Nominees for the 24th Annual Critics' Choice Awards". Critics' Choice Awards. December 10, 2018. Retrieved January 9, 2019.